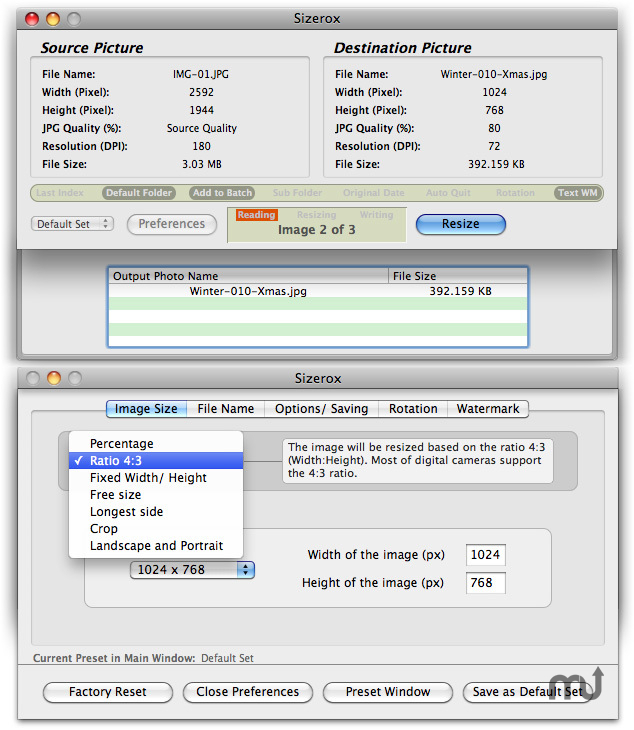 Resize, rename photos using drag-and-drop and presets. Is there a better alternative to Sizerox? Is Sizerox really the best app in Image Editing category? Will Sizerox work good on macOS 10.13.4? Sizerox is the simple way to resize, rename, crop, rotate, and watermark hundreds or thousands of images with a single drag-and-drop using presets. Mostly when you want to email your friends pictures, post images on your website, or upload them to your iPod, iPad, or iPhone, you recognize that the images are too big. You need to reduce them, but resizing and renaming images takes too long. Why spend valuable time altering each image by hand? Resizes your JPEG, TIFF, PNG or PSD images and saves them as JPEG. You can easily resize, rename, crop, rotate and watermark your images from your digital camera or scanner to send them with e-mails, to use them on the Web or to upload them to your iPod, iPad, or to your iPhone. Uses Apple Quicktime to save the resized images, so the quality of the resized images is always high. Supports drag-and-drop. Drop as many image files as you want or a folder that contains hundreds or thousands of images to the main window as well as to the application icon to resize the images. When you drop images on the Sizerox application icon, Sizerox will start up and will immediately begin the job. Sizerox can quit automatically after the job is finished. In order to have different settings for different jobs, you can use a preset (pre-defined setting) for each job. Offers several possibilities to resize your pictures. Can rotate images to the left or to the right while resizing. Can create image watermark and text watermark that will ensure the security of your images.